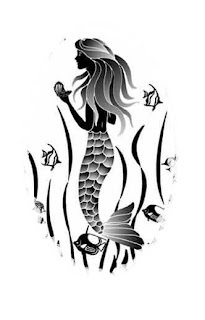 Sea Glass, Beach Glass or Mermaid Tears is created when glass items have been disposed of in the oceans by man or by sunken ships and vessels. Once it is in the ocean they are smoothed by the actions of the waves, sand and stone to create these lovely little pieces of sea glass gems. Sea glass washes up on nearly every beach on earth. Sea glass has been a part of history since early civilization. According to authors C.S. Lambert and Pat Hanbery, "Rich cargoes of ceramic and glass lie on the ocean's bottom, the result of shipwrecks, piracy and foul weather. Doesn’t that make you envision Black Beard or Captain Jack Sparrow dumping there empty bottles of Rum overboard? The color of sea glass is determined by its original source. 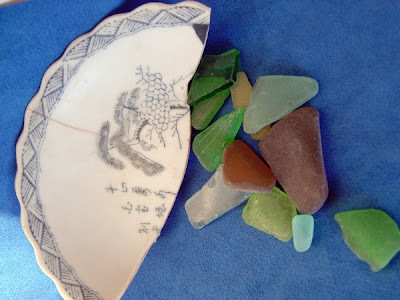 Most sea glass comes from bottles, but it can also come from jars, plates, windows, ceramics or sea pottery ( "sea china" or "sea porcelain" or "beach pottery") see image below of a piece my husband Andrew collected while diving on a sunken World War II Japanese ship in the Pacific many years ago! The most common colors of sea glass are kelly green; brown, blue and purple (clear). These colors come from bottles used by companies that sell beer, juices, and soft drinks. So the next time you’re strolling along the beach don’t be surprised if you look down and there washed up on the beach is a Mermaids Tear.